Ohrstrom Library Digital Archives » Blog Archive » Erastus Corning Jr.
Erastus Corning Jr. attended St. Paul’s School from 1866 to 1869 and is a member of the Form of 1873. Imprinted with photography studio logo and information: "Kimball Brothers, State Block, Concord, N. H.". "E. Corning Jr" written in ink along the top edge with "1868-1869" written in pencil beneath it. 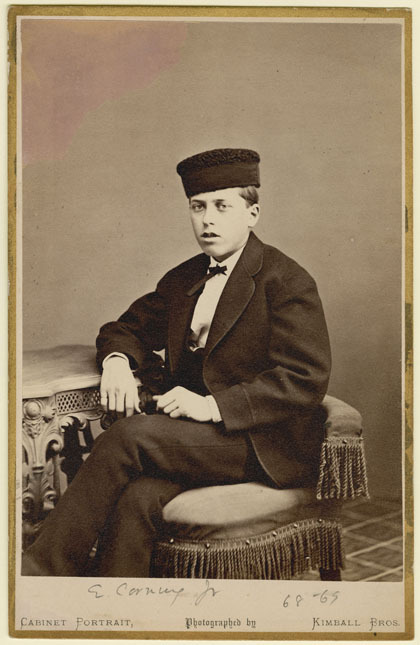 A standard cabinet card with photograph mounted on heavy paper board with metallic gold border. "Cabinet Portrait, Phorographed by Kimball Bros." printed across the bottom edge with "E. Corning Jr 68-69" written in pencil just above it. There is a pinkish colored stain in upper left corner of the photograph. Kimball Brothers. "Erastus Corning Jr." St. Paul's School. Ohrstrom Library Digital Archives. Web. 26 Apr. 2019.